Another beautiful day in Northern California. We are warmer than other years, but it's going to cool down next week. Apple season is in full swing and I love apples, and I love apple cider. Green, Yellow and White...What a great color combination. Crisp and clean like a crunchy fresh apple. 'Apple Cider and Apples' Table centerpiece. The apple cider is poured. Would you like to join me? The Linden Street Goblets are from TM. The Anemone is blooming. The long-lived, fibrous-rooted perennial is indispensable for fall color. The Anemone has graceful branching stems 2-4 ft. that rise high from clumps of dark green, three-to five lobed leaves covered with soft hairs and a cluster of blooms on the top. The Shannon Crystal apple dish was my inspiration for this tablescape. The Italian made bottle contains delicious apple cider and a soft pastel green runner and my new white flatware from WalMart gives the casual look for a luncheon or afternoon snack. The apple napkins under the crystal apple dishes are attractive on the white salad or dessert plates. My apple napkins are another TM purchase. I love Tuesday Morning! The reusable Italian cylindrical glass bottle with a clasp closure top is perfect to store my apple cider. Cheers to a sunny afternoon. Thank you for visiting My Cozy Corner. I enjoy setting the table for some food and fellowship. Please join me as I visit some awesome blogs. It's a beautiful table, Betty. You remind me our Anemone's are blooming. Yours make a very pretty centerpiece. Betty, What a wonderful fall theme for a table. Apples and cider just perfect! I'm in love with your anemone's, such beautiful flowers. What a perfect Fall table at your Cozy Corner! What says Fall better thank apples and cider? I love your new WM flatware, too. Soooo pretty! I love all the details and the green apples! Love it all. Thanks for linking up! While I would not want to keep my doctor (husband) away, I'm still cool with eating an apple a day! He does it! :-) I'm so jealous that your anemones are in bloom while we are expecting a cold front to move in overnight that is all but guaranteed to kill of everything here in the Midwest. We knew this time would have to come just as it does every year, but it just seems too soon! I love the vessel in which you served the cider. Very pretty!!!! Betty, I love your tablescape! Happy fall! 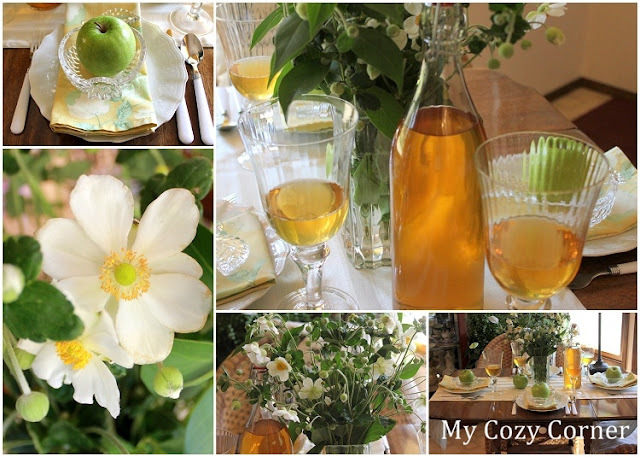 Beautiful tablescape and I do love apple cider. This is simply stunning! Thanks for linking up! What a beautiful table for fall! Love your little dishes holding the apples! So charming! Love the color combinations, the view out the window. Perfectly delightful. What a charming tablescape! It's so inviting with the beautifully set table and the luscious green apples. Thanks so much for joining in this week! I love every single element of this post; the table settings, your beautiful center piece, the bottle, the tea cart and the setting. Um, should I call before I come over? If I wasn't following you before, I am now (: Blessings. This is such a lovely table...love that tea cart. Such a lovely table setting!! I'm drinking raw apple cider right now - but I bet it would taste better drinking it out of your crystal than my plastic glass!! Love the tea cart with it opened! One of my weaknesses is tea carts. The tea table settings are as crisp as your apples. Darling crystal apple bowls and sparkling apple cider in sparkling crystal goblets! 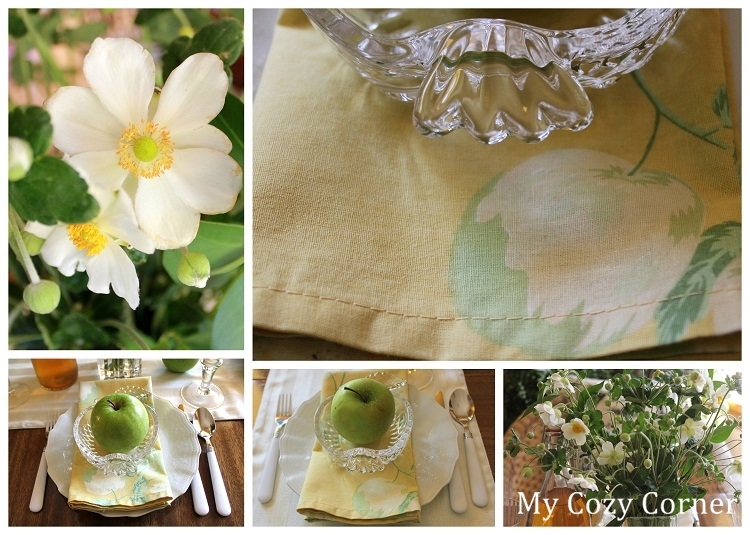 The apple green and white colors are accented by the pretty napkins! So Lovely! This is so refreshing. Lovely.. The tea cart is fabulous...makes the perfect place for lunch. Beautiful bouquet. Terrific post. Your tablescape is lovely! I can just smell the crisp apples. Visiting from A Favorite Thing Saturday and am your newest follower. Please stop by Still Woods Farmhouse sometime for a visit! I'll have a cup of mulled cider for our visit! Love the colors, crisp and calming!